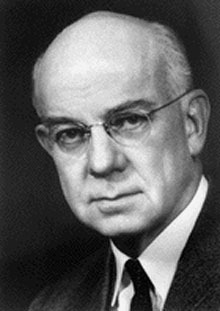 Edward C. Kendall was educated at Columbia University, then worked at a hospital affiliated with Columbia, where he studied hormones of the thyroid. When he was assigned to analyze the chemicals in a box of breakfast cereal, he quit on the spot, and almost immediately accepted an offer from the Mayo Foundation, affiliated with the University of Minnesota. He spent decades at Mayo, searching for the active factor of the adrenal gland, and identified several steroids, including cortisone, corticosterone, and hydrocortisone. Cortisones are widely used in treating numerous diseases, including maladies of the eye, skin, kidney, and lungs. Kendall also isolated the peptide glutathione from yeast, and isolated thyroxin, a hormone of the thyroid gland. For his research into the structure and function of adrenal cortex hormones, Kendall won the Nobel Prize for Medicine in 1950, shared with his Mayo colleague Philip S. Hench and, working simultaneously but independently at the University of Zurich, Tadeus Reichstein.